Learn your deen and have fun in a safe environment. Come and discuss your daily life challenges, living in the west and going to public schools and any other issues you wish to talk about. Tell us your life stories which others can learn from. Many fun outdoor and indoor activities will be organized. Come and make new friends. 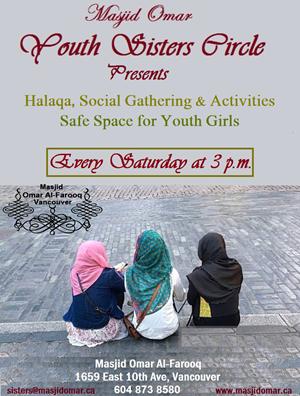 Youth Sisters Circle - a gathering of teenagers this Saturday at 3 p.m. We will continue our discussion on Status of Women in Islam.